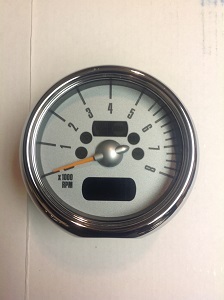 Used Tachometer with Chrome trim for 2002-2006 R50 R52 R53 MINI Cooper and Cooper S. If you tach has failed or you just want to dress it up this is an affordable option for you. This is a good used tach removed from one of the wrecked MINIs we are parting out. We have tested it and know it is in good working condition. sold as individual tach as seen in pic.